New York-based Hacker School is a three-month, immersive school for becoming a better programmer. It’s like a writers retreat for hackers. This program is run every four months in New York and meet Mondays, Tuesdays, Wednesdays and Thursdays from 10:30am to 6:30pm. It provides space, time to focus, and a friendly community dedicated to self-improvement. Unlike most schools, there are no grades, teachers, or formal curricula. Instead, Hacker School is entirely project-based. We have a morning check-in at the start of each day. During this time we close our laptops and share what we worked on the previous day, what we plan to do that day, and where we’re stuck or need help. This social pressure keeps everyone focused and accomplishing what they say they will. It also fights scope creep, because someone in the group will surely notice when your spell-checker starts turning into an OS. There are no formal instructors at Hacker School. Rather, everyone is a de facto teacher, which works because everyone enters Hacker School at different levels of development. Some people are much more advanced than others, but everyone has something to share. The primary expectations are that people start with at least a general programming proficiency and finish much better than they started. Everyone writes free and open source software, because it would be antithetical to Hacker School to write code that couldn’t be read, used, and improved by others. Code you write in traditional schools is characterized by being both useless and destined for /dev/null. Code written at Hacker School is the opposite: Genuinely useful and written to be maintained and improved over time. While most of Hacker School is spent working on your own projects, we occasionally work in groups on existing open source software. The idea is to focus the entirety of the group’s energy on a handful of projects and contribute as much as we can in a four-day period. We pair program and fix bugs, write documentation and contribute new features. It’s an opportunity to collaborate with other Hacker Schoolers and to experience working on (and giving back to) established OSS communities. We invite other hackers to code with us on Thursdays. These are typically either alumni or experienced programmers we think will have a lot to share. Sometimes they give formal talks, and sometimes they just answer questions and hack with the group. We all go out to dinner together every Monday. We also have movie nights, because movies are great. You should genuinely enjoy programming. That’s most important. We spend our time talking about technical problems and writing code, not working on startups and products. 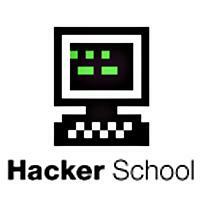 If you care more about startups than coding, you won’t enjoy Hacker School. We look for curiosity, passion, raw intelligence and a desire to build things. The best way to show us this is to have a track record of writing code and learning new things. If you’re a smart, curious person who loves coding, it will come out naturally. Don’t try to trick us. It probably won’t work and it won’t get you what you want anyway. You should treat Hacker School like a job, not in the negative sense of something you have to do, but in that it’s a serious commitment you don’t blow off. When you agree to do Hacker School, you commit to coming four full days a week for three months, and taking your time here seriously. Please don’t do Hacker School unless you can make this level of commitment.